You can get your full daily RDA of irony by reading it all. 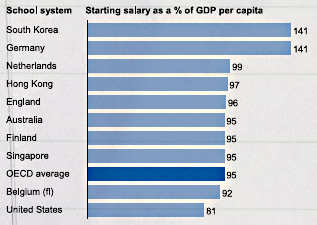 The author's of the study argue that the countries higher on this list also have better student results. Now, I will confess that this is a pretty interesting finding in the study -- that starting teacher pay is more important than teacher pay in later years, because the key is to attract talented people right out of college away from other professions. Interesting. Well, now the NEA might be getting really nervous. Something like this might cause parents to do something rash, like demand that low-performing teachers get fired. Gasp. If school choice is off the table, then I would be very supportive of a program to increase starting teacher pay, funded by larger class sizes and substantial reductions in useless administrators and assistant principals. Anyway, it is kind of an interesting study, though you may find the pdf file format really irritating to try to read. Lots of funny formatting.